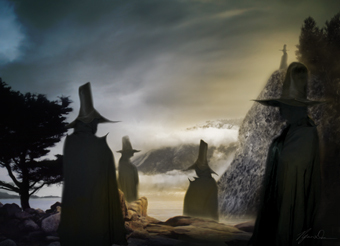 The Watchers are black, humanlike phantoms who stand silhouetted against the sky on the Santa Lucias’ ridges and peaks. Nobody knows what they are, where they came from, or why they haunt these mountains. Nevertheless, they’ve been seen many times over the years, with stories about them dating back to Chumash Indian legends. They are said to appear most often around twilight, seemingly staring into space from their hilltop posts. The Dark Watchers were immortalized in different works by Monterey County’s two greatest literary figures. Nobel Prize-winning author John Steinbeck, in his short story “Flight,” told of the hero seeing “a dark form against the sky, a man standing on top of a rock” in the Santa Lucias. And the iconoclastic poet Robinson Jeffers wrote of the mountains’ “forms that look human…but certainly are not human” in his poem, “Such Counsels You Gave to Me.” Whether the two writers ever actually saw the dark phantoms, or were just drawing on the rich local lore, is not known. More recently, a local high school principal was on a hunting trip in the Santa Lucias when he spotted a dark figure in a hat and long cape, standing on a rock across a canyon and slowly surveying the surroundings. When the principal called out to the other hunters, the phantom vanished, and the man was left wondering.